Are you going to a festival this Summer? Or are you a bit of a fogey like me who would be happy to wear this gorgeous crown about the house? Last year when I sent out a ‘Design Team Call’, I was so happy to receive an e-mail from the very talented Mercedes Pascuale and I was thrilled to bits when she told me what her project was! If you follow me on pinterest, facebook or even twitter, you may have noticed how much I LOVE flowers. I’m not sure what it is that delights me so much, but I’d be surrounded by flowers every single day of the year if I had the chance. 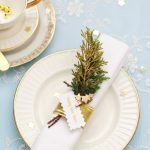 I have shared plenty in The Craft Cafe Tutorials section of this blog or even take a look at the DIY Archives here on Heart Handmade UK. PSSST – This is Claire busting in with a brand new tip for Mercedes! I found this wire that was already covered in the paper tape. 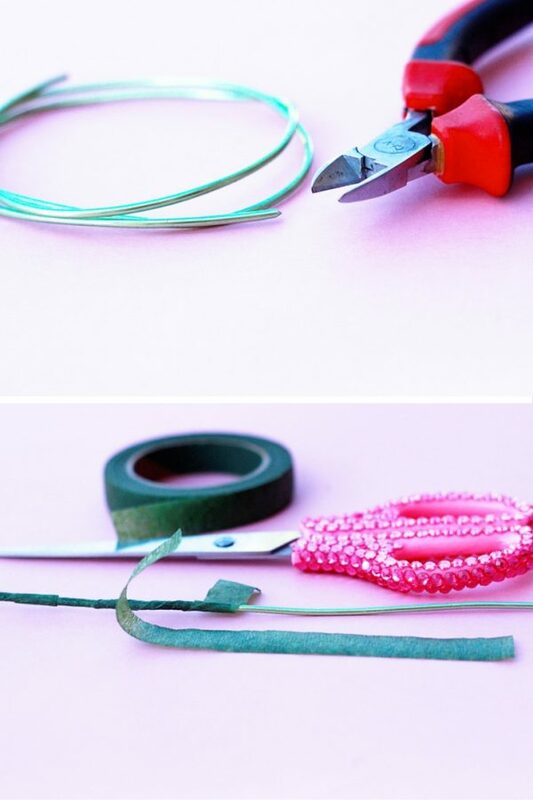 Use the measuring tape to Measure the outline of the head, add 10cm and then cut the aluminium craft wire. We will use those extra centimetres to close the crown. 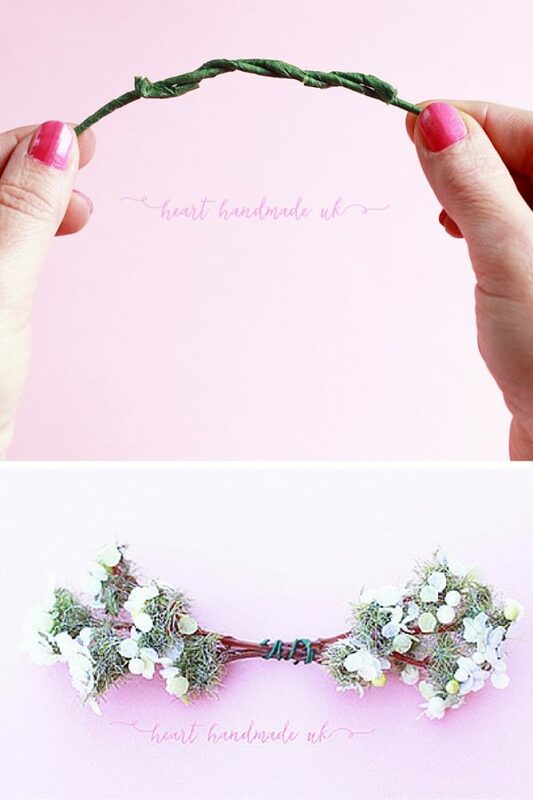 Cut little pieces of floral tape. We will use those pieces to line the aluminium craft wire. Take both ends of the wire and wrap them around each other, the left side one on the right side one and the other way around. Make four bunches of flowers, they have to follow the same pattern. Place them in the most important places of the crown: up and down, right and left. 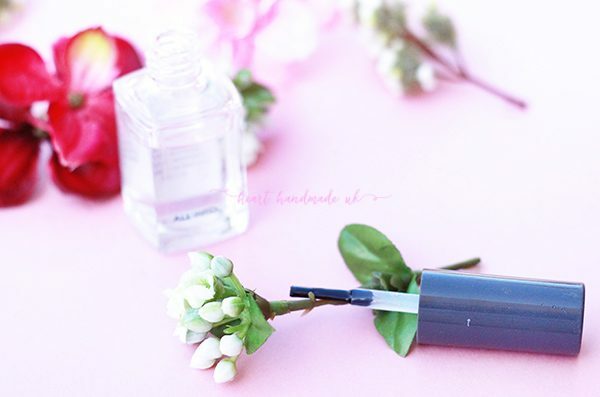 Tip 2: Sometimes flowers fall from the stems, to avoid this use some transparent nail polish in the joints. 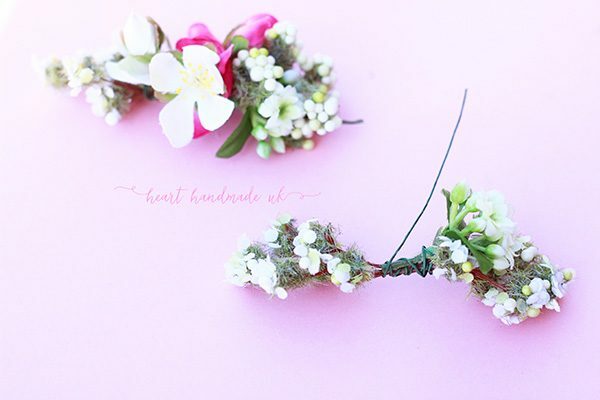 5.1.-First of all, I have tied a very thin green floral wire to the first and to the last flowers leaving some space in between; these flowers are the same, type 1, they are the ones that determine the width of the pattern. 5.3.- and type 3 and 4 in the middle. Notice that type 3 and 4 are the same, but in different colours. 5.4.– Repeat this step three more times at the end you should have four little bunches of flowers. 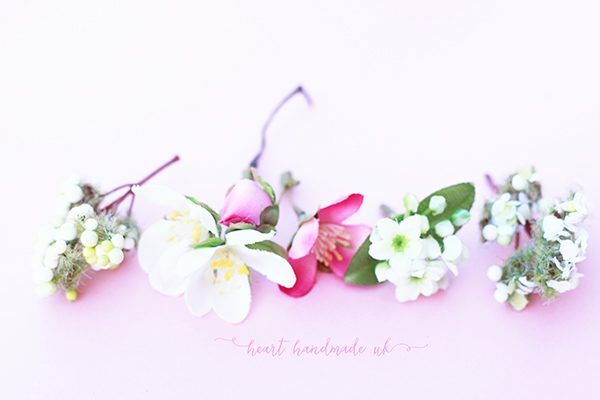 Tie the four little bunches of flowers in the most important parts of the crown, up and down, left and right; do it with a very thin wire. Add the type 1 flowers to the rest of the crown; make sure to cover the rest of the aluminium craft wire to avoid empty spaces. Fix the details: add some leaves and flowers, glue some leaves together with silicone and remember that if you want to add flowers you have to do it in a symmetrical way on the four sides. 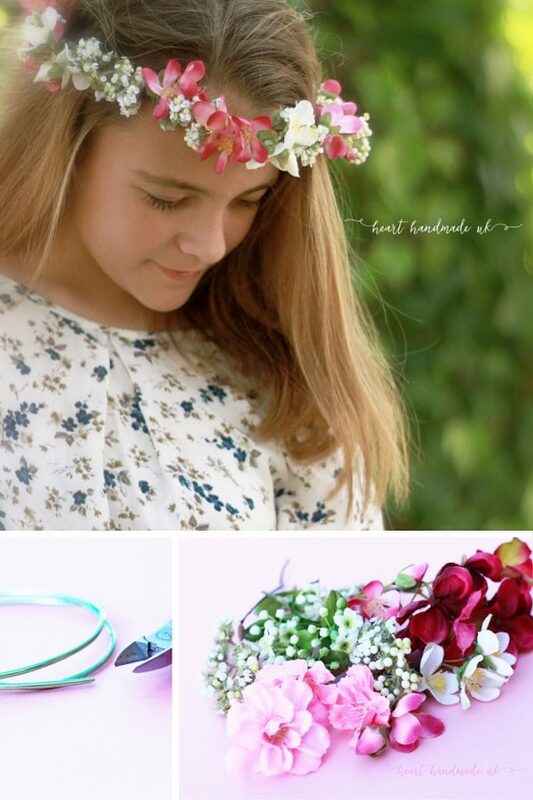 Done, enjoy your one of a kind summer time flower crown! Download your free copies of the Free Magazines! What did you think of this project? Do you think it’s something you would add to your project pile? Oh my goodness, of course I am fully encouraging a wonderful exchange of comments. So please feel free to share the flipping heck out of this post on the Social Medes! Psst – did that make me sound hip and cool? And not like a 30 year old Grandma?! Hello Claire, this is a beautiful diy, so lovely it is, and your new blog looks amazing, I love the new layout, the color, congratulations my friend, and success to you, always. Beautiful AND fabulous! 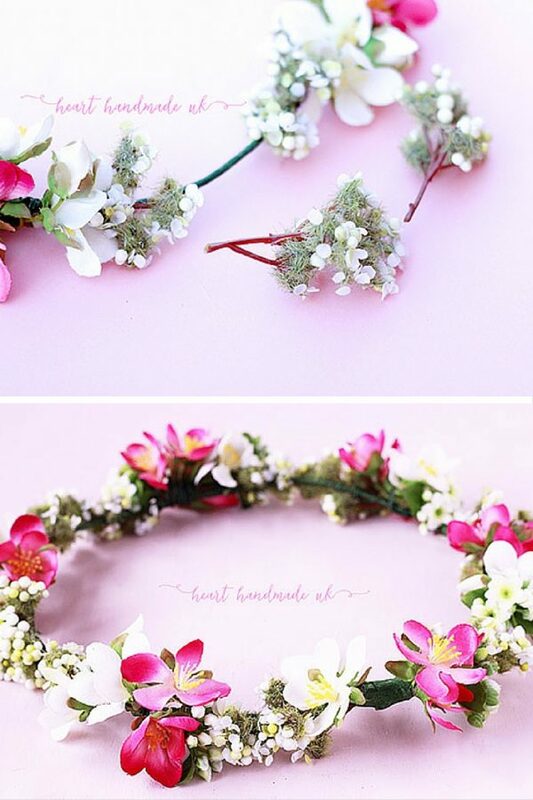 Love this gorgeous crown – just coming home from Hawaii, I would have loved to make one of these to wear – you don’t have to be a child to feel like one….right? 😀 Love it!